Sacrament meeting on Sunday was one of the best that they've had in a while. I think everyone has been struggling with church lately and although it was mentioned during the meeting that sometimes winter does that to you, it's not that at all. There are things happening in this community that you can't really come back from. I can't do anything about it and I have to keep on living. Safer to stay out of things really. Safer to be happy with what you have. Safer to keep to yourself. Work continues to bring me solace. It also helps me appreciate just being home and sitting on the couch at the end of the day watching Hub's roll around on the floor being crazy. If I've learned anything this year, it's to leave your woes outside when you get home. I've learned to let home be a place of comfort. A place to forget the worries of life and just unload by laying on the couch as graceful as a dead swan and as unlady-like as one could get after a day at work. I've been teaching him how to say his prayers before eating food. He knows to be quiet and listen during the saying of the prayer. It took him about two weeks to fold his arms and even though they look like T-Rex arms when he folds them, it's good enough! Next challenge is to close his eyes during. He watches us curiously during the prayers. He's pretty clever .. might even be a genius. Hub's is at work with me so much she got her own uniform. Pizza pie for dinner on Friday. 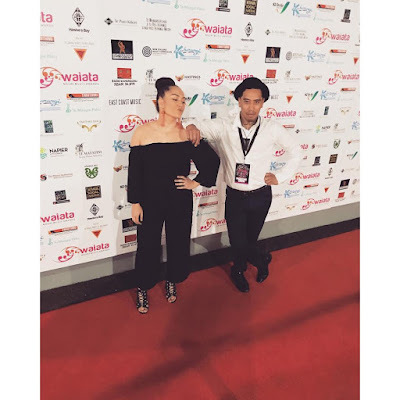 Tyler rocking the red carpet at the Waiata Maori Music Awards last Friday. Want Need a new car. Also need a payrise for a new car.